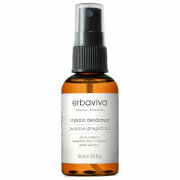 Keep fresh naturally with the Erbaviva Jasmine Grapefruit Organic Deodorant; an organic, plant-based spray that effectively reduces perspiration and combats underarm bacteria. The award-winning anti-perspirant formula combines rapid evaporating organic Grain Alcohol with extracts of Jasmine, Ginger and Grapefruit Oils to neutralise odours and minimise sweating for underarms that feel clean and soft. Suitable for both men and women with a zesty natural fragrance. Can also be used to freshen up gym clothing and accessories. USDA Certified Organic. Free from aluminium, chemicals, parabens and sulphates. Not tested on animals. Use once daily in place of usual deodorant, or as often as needed. Allow the body time to adjust to it (the pores in your underarms need time to rid themselves of the residue from other less natural deodorants). Alcohol, *Citrus Grandis (Grapefruit) Peel Oil, *Citrus Aurantium Dulcis (Orange) Peel Oil, *Citrus Limon (Lemon) Peel Oil, *Zingiber Officinale (Ginger) Root Oil, *Vetiveria Zizanoides Root Oil, *Jasmine Officinale (Jasmine) Flower Extract, *Cupressus Sempervirens Leaf/Nut/Stem Oil, *Salvia Officinalis (Sage) Oil. *Denotes certified organic ingredient.